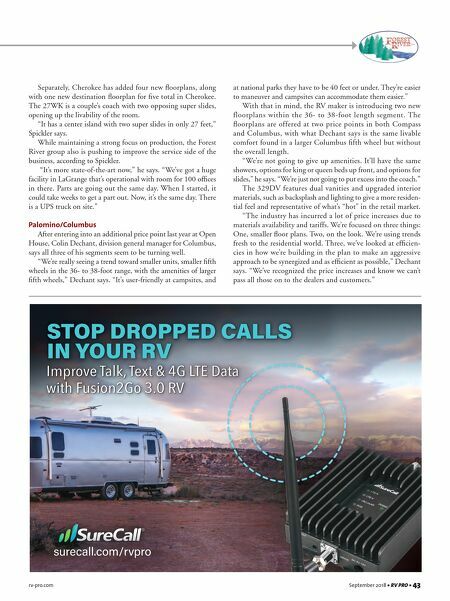 rv-pro.com September 2018 • RV PRO • 43 Separately, Cherokee has added four new floorplans, along with one new destination floorplan for five total in Cherokee. The 27WK is a couple's coach with two opposing super slides, opening up the livability of the room. "It has a center island with two super slides in only 27 feet," Spickler says. While maintaining a strong focus on production, the Forest River group also is pushing to improve the service side of the business, according to Spickler. "It's more state-of-the-art now," he says. "We've got a huge facility in LaGrange that's operational with room for 100 offices in there. Parts are going out the same day. When I started, it could take weeks to get a part out. Now, it's the same day. There is a UPS truck on site." Palomino/Columbus After entering into an additional price point last year at Open House, Colin Dechant, division general manager for Columbus, says all three of his segments seem to be turning well. "We're really seeing a trend toward smaller units, smaller fifth wheels in the 36- to 38-foot range, with the amenities of larger fifth wheels," Dechant says. "It's user-friendly at campsites, and at national parks they have to be 40 feet or under. They're easier to maneuver and campsites can accommodate them easier." With that in mind, the RV maker is introducing two new floorplans within the 36- to 38-foot length segment. The floorplans are offered at two price points in both Compass and Columbus, with what Dechant says is the same livable comfort found in a larger Columbus fifth wheel but without the overall length. "We're not going to give up amenities. It'll have the same showers, options for king or queen beds up front, and options for slides," he says. "We're just not going to put excess into the coach." The 329DV features dual vanities and upgraded interior materials, such as backsplash and lighting to give a more residen- tial feel and representative of what's "hot" in the retail market. 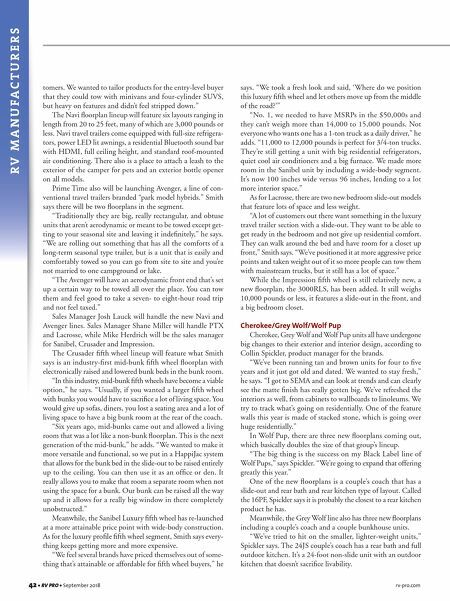 "The industry has incurred a lot of price increases due to materials availability and tariffs. We're focused on three things: One, smaller floor plans. Two, on the look. We're using trends fresh to the residential world. Three, we've looked at efficien- cies in how we're building in the plan to make an aggressive approach to be synergized and as efficient as possible," Dechant says. "We've recognized the price increases and know we can't pass all those on to the dealers and customers."